Battlegrounds - Vampires vs. Lycans! All Forums >> [Artix Entertainment Games] >> [AdventureQuest] >> [AQ Encyclopedia] >> Locations / Quests / Events >> Battlegrounds - Vampires vs. Lycans! You can skip the cutscene at anytime. ??? : <<You>>! We were expecting you! Meet me in the first cabin in the clearing! VicTimmy: I am VicTimmy and this is my big sister, Wjero! Wjero: Hello, friend. Our town of Victimia is one of the last human settlements in Darkovia. For over a hundred years we have been fairly safe. Wjero: ...But the recent Dracopyre conflict has further reduced populations -- the resources that vampires and lycans depend upon. Wjero: Many Darkovians have fled, and others have simply become casualties in the wars. This has increased tensions between Safiria and the Werewolf King. VicTimmy: Our parents are among the missing. VicTimmy: Hey!! What is so funny about that!?! <<You>>: Oh--Sorry!! I didn't mean to laugh at that. But-- Is this town really named Victimia? And your name is VicTimmy?? <<You>>: Heh...Sorry again. There is absolutely nothing funny about that at all. Please continue. Wjero: Right now, Victimia is safe-- because the Vampires and Lycans are fighting over who gets us when they're done with each other! Wjero: As you can see, that is not a very good position to be in. But we have a little time. So please-- if you can-- help us! 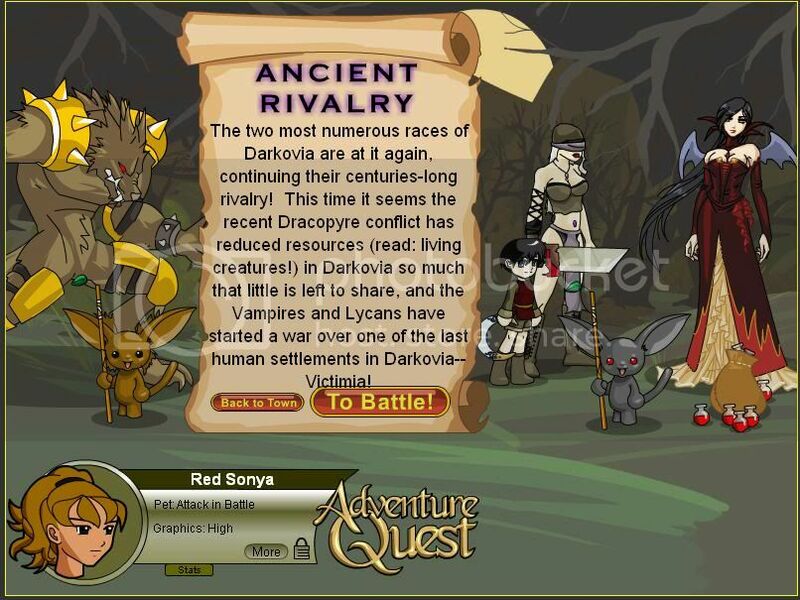 The two most numerous races of Darkovia are at it again, continuing their centuries-long rivalry! This time it seems the recent Dracopyre conflict has reduced resources (read: living creatures!) in Darkovia so much that little is left to share, and the Vampires and Lycans have started a war over one of the last human settlements in Darkovia-- Victimia! Guardians can refill their health potions by clicking on the potion bag if they have less than 5 on hand. Were-Moglin: Thanks for risking your life in the name of the Brotherhood of Wolves! Together we will vanquish the fanged Vampire menace! Were-Moglin: If you need to be healed I can help you. Were-Moglin: There you goes! All healed up! May you slay those pale-skinned Vampires swiftly! Moglopyre: Thanks for risking your life in the name of Queen Safiria! Together we will vanquish the furry Lycan menace! Moglopyre: If you need to be healed I can help you. Moglopyre: There you goes! All healed up! May you slay those foul-smelling Werewolves swiftly! Clicking on the NPCs displays certain messages. The Werewolf King has ruled his vast network of were-creatures for decades now. Wjero and VicTimmy need your help! Safiria, Queen of the Vampires, oversees her dark realm from a castle in Darkovia. If your subrace is not Vampire, the message "Search Darkovia to become a Vampire if you want Queen Safiria to join you!" appears. If your subrace is not Werewolf, the message "Search Darkovia to become a Werewolf if you want Werewolf King to join you!" appears. Were-King: Hah hah haaa! Victimia belongs to the Lycans!! VicTimmy: My sister brought you back from the brink of death using her knowledge of herbal remedies! The rest of the dialogue is the same as if you beat the Werewolf King. <<You>>: Wh--what happened to the monsters?? They're gone? Wjero: Your own "bite" surprised them more than they expected! Even though we didn't necessarily WIN, your display of bravery in challenging their leader sent them back to their lair. VicTimmy: They'll think TWICE before they try to get Victimia again! Twilly: I can heal you now if you need help! Update of existence of Safiria challenge battle by Shadow Genesis. Varied monster list depending on warring side and link fix thanks to Archlist. Rarity and corrections thanks to Archlist.